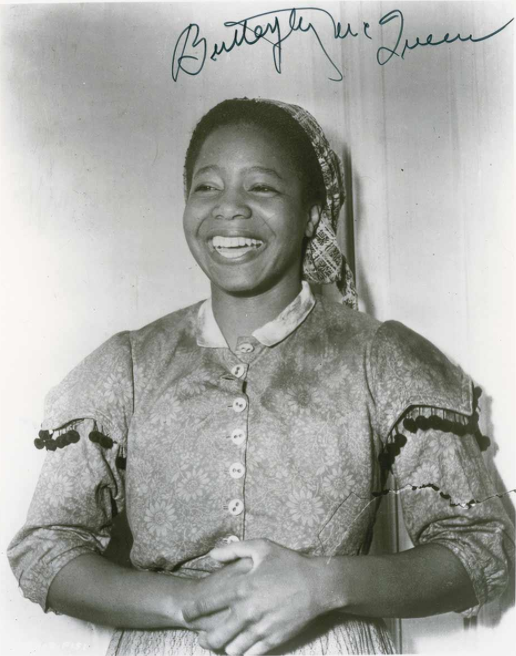 When the lady on the other end of the line started talking, I knew it could be only one person: Butterfly McQueen, the actress who played Prissy in Gone With the Wind (1939). She was calling collect from a phone booth in Harlem — she had no phone in her apartment. I was interested in interviewing her for Hollywood Studio Magazine‘s 50th anniversary of the classic film’s release. She was enthusiastic about her recent activities, including community activism and a trip to Africa. Because I was unable to make the trip to New York , Butterfly suggested that we do the interview by mail. I would send her the questions. 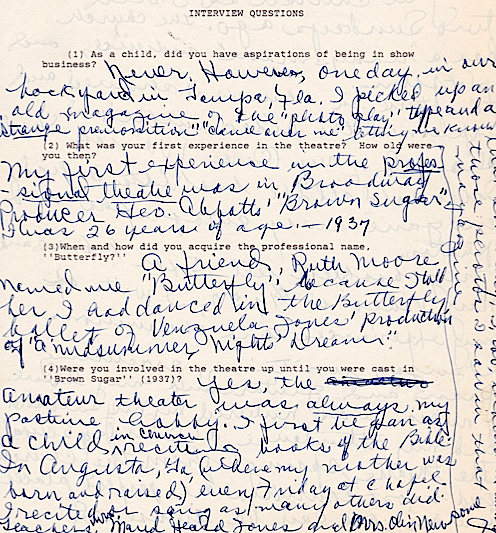 She would answer the questions in writing and return the pages in a self-addressed, stamped envelope I had enclosed. Here is how our conversation unfolded. Michael: Were your ambitions to become an actress? Butterfly: Never. However, one day in our backyard in Tampa, Florida, I picked up an old magazine of the “photoplay” type and a strange premonition came over me, letting me know that some day, I, too, would be among those photos I saw in that magazine. Michael: What was your first experience on the stage? 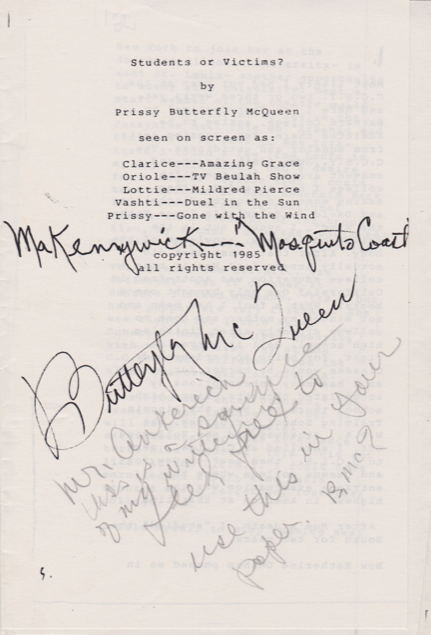 Butterfly: My first experience in the professional theater was in Broadway producer George Abbott’s Brown Sugar. I was 26 years old. Michael: How did you acquire the name Butterfly? Butterfly: A friend, Ruth Moore, named me Butterfly because I told her I had danced as a butterfly in Venezuela Jones’ production of A Midsummer Night’s Dream. Michael: What stage experience did you have prior to Brown Sugar? Butterfly: The amateur theater was always by pastime hobby. I first began as a child in church, reciting books of the Bible. In Augusta, Georgia (where my mother was born and raised), every Friday at chapel, I recited or sang, as many others did. Although I am now an atheist, I still prefer performing in church as I did two Sundays ago. The church has a “ready made” audience and platform. I have always enjoyed writing and practicing the piano and guitar. My love of music was nurtured by my mother and my attendance in Sunday School. I hope some day, our churches will serve our communities each day of the week and have teachers for an everyday existence, rather than preachers for a dubious hereafter. Michael: How did you get the role of Prissy in Gone With the Wind? Butterfly: Newspaper critics who saw me in Brown Sugar, Brother Rat, and What a Life gave me such excellent notices and agents signed me to go to Hollywood. Michael: Did you realize that a classic was being made during the production of Gone With the Wind? Butterfly: I don’t believe any of the cast did. We were all ‘high quality’ actors doing our very best. Michael: Do you have any lasting impressions of Clark Gable and Vivien Leigh? Butterfly: Everyone in the cast with whom I was involved were ladies and gentlemen. Miss Leigh had the hardest part to do. She was always polite, as everyone was. The full year I never heard even a “darn.” One day, Mr. Gable’s script was late and I think he wanted to curse, but because I was at his side, he only gritted his teeth. Michael: How did you feel about your role in the film? Butterfly: Mr. Gable said to me once (the only time he had cause to speak to me), “What’s the matter, Prissy?” His tone of voice implied that “if they are not nice to you, you let me know.” Mr. Gable asked me, “What’s the matter, Prissy?” I was so unhappy about my role and was forever whining and crying out loud. I didn’t answer Mr. Gable. I’m sure I stopped whining. I could tell anyone how hurt I was that I was not to show what great progress we blacks had made, yet, in 1937, I had to be a stupid, backward ignoramus. Producer David O. Selznick understood and sympathized with me. 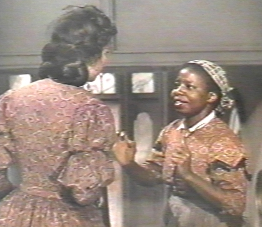 The black wardrobe woman forgave my tantrums. She, too, seemed to understand my hurt. 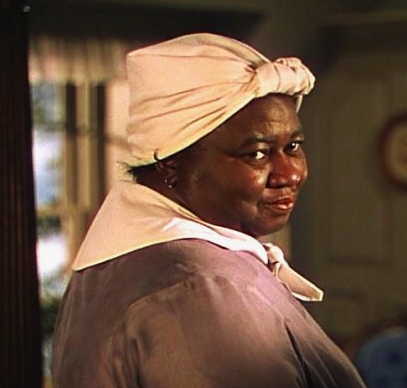 Hattie McDaniel (Mammy) said, “You’ll never come back to Hollywood!! You complain too much! !” Mr. Selznick put me in two more movies (Since You Went Away and Duel in the Sun). Michael: What are your thoughts today about your role as Prissy, almost 50 years later? Butterfly: Oh, thank goodness! Would you be writing me if there had been no Prissy? I very doubt it! Would I be in a very beautiful studio apartment? Would I have fans all over the world? I think not. My past misery has brought me present joy and well-being. Michael: I have to ask you about working with Joan Crawford in Mildred Pierce. 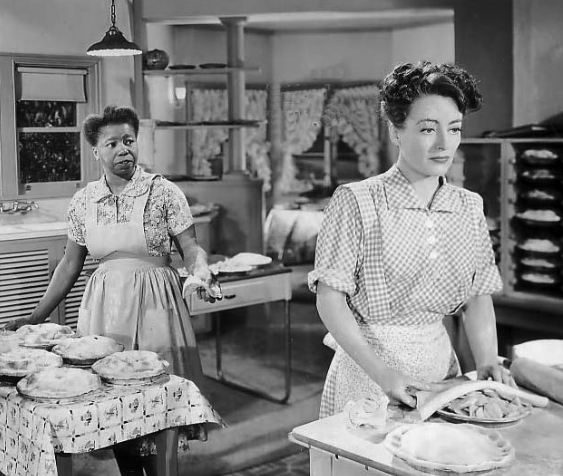 Butterfly: In Mildred Pierce, Miss Crawford was more down to earth than she appeared when I was with her in The Women. Michael: Of the many motion picture legends you worked with, do you have several who stand out as exceptional? Butterfly: I respect all of the “greats.” One has to respect the so-called “greats,” because they have kept level-headed, which isn’t easy to do in this hypocritical America (smiles). Michael: In 1975, you received a degree in political science. Butterfly: My degree is liberal arts. Each semester one is allowed to change one’s major. Only one semester did I study politics. Other semesters I have studied music, art, introduction to law, and other subjects. It was not difficult to secure credits, because after I made money in G.W.T.W. and had time, I went to college as a hobby. I was not serious about a degree until I had a desire to be a recreation center director. Michael: Tell me about your community activism. When did you begin to work in the community? Butterfly: I suppose when I saw how down hill our appearance began. I try to keep beautiful neighborhoods. There are many more duties, but I chose this one because it is most gratifying, I think. At voting time, I work, but I don’t talk about politics. I, a registered Republican, have crossed over and voted for a beginning Adam Clayton Powell Jr. and a Jimmy Carter. Michael: You mentioned to me over the phone about going to Africa last year. What was the purpose of your trip? Butterfly: I went because my roots are there. I found out in Ghana that children wanted pencils and paper. I’m sending them the same, thanks to my fans. I’m trying to achieve dual citizenship. Michael: Do you still receive mail from your fans? Butterfly: Yes! Mail is always very heavy. I feel I must continue to be worthy of people’s admiration, such as keeping myself educated and caring for others. Each one of us was born to carry on the good which we have inherited. Michael: How do you want to be remembered, for your work in entertainment or your community activism? Butterfly: Both! 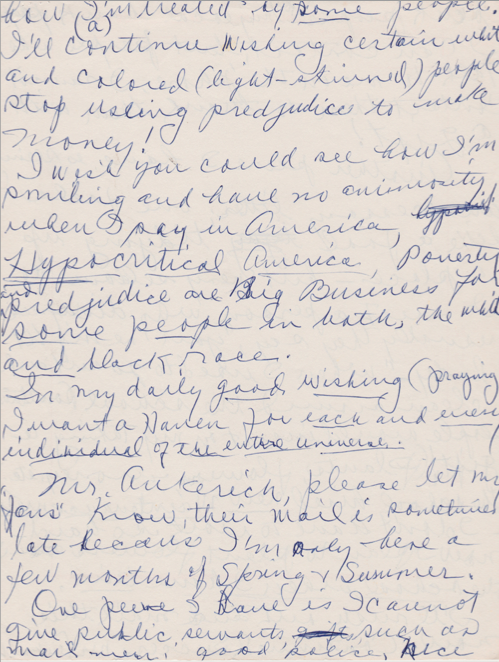 Seriously, Mr. Ankerich, I would like to be remembered as the person who advised her American blacks that if they are as dark-complexioned as I am, they should be very happy and pleased that they have built a harmonious haven for some white and light-skinned people. Isn’t it ridiculous, Mr. Ankerich, that there is no place where there is a welcome mat for all Europeans? Let America be that place. We of African descent (if one is dark-skinned) should build Africa as we have helped to build America. Civilization began in Africa. Why not perfect it there? When I was a child, I was not told of prejudice. I learned of prejudice when I came north. The first I heard of social injustice was when we sang, “They’re hanging men and women for ‘The Wearing of the Green. '” Black-skinned people, such as I, would give more space for white and light-skinned people. I do not want America to continue being hypocritical about wanting back-skinned people here, because I know I’ve been helped mostly by those of lighter skin than I, in spite of my being industrious and intelligent. Two Sundays ago, I explained to a church audience about why I keep a low profile. I know who has helped me: the Margaret Mitchells, the David O. Selznicks, and light- and dark-skinned people of my own race. However, I would not want anyone to go through some of the unpleasantness that many of us Americans suffer, white and black. Some people are as honest as the black bus driver here in Harlem who told me to go sit in the back of the bus because I was too black to sit up front. The Polish lady who told us (my mother and me) she was fighting us because we were black colored. 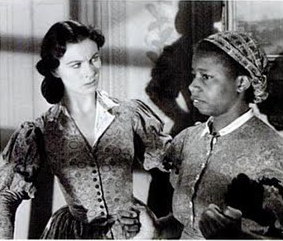 I told her I would not have moved into the neighborhood if other colored people had not already been living there. I looked around, and sure enough, my mother and I were the blackest-skinned. Another honest American was the politician in Queens, who, on America’s 200th birthday, said that all people were welcomed here except the black women. They should go back to where they came from, he said. No one said a word until the Japanese said our minorities hinder America, and I agree in part. America, white and light-skinned America, could progress faster if it didn’t stop to try to keep us black-skinned people in “our place.” Having said this, Mr. Ankerich, I’ll continue trying to make America the Heaven I know she is for many, in spite of how I’m treated by some people. I’ll continue wishing certain white and colored (light-skinned) people stop using prejudice to make money! I wish you could see how I’m smiling and have no animosity when I say that, in America, hypocritical America, poverty and prejudice are big business for some people in both the white and black race. In my daily good wishing (praying), I want a haven for each and every individual of the entire universe. Mr. Ankerich, please let my fans know that their mail is sometimes late because I’m only here a few months of spring and summer. I’ll rush out and mail this now. Continued success, Mr. Ankerich. 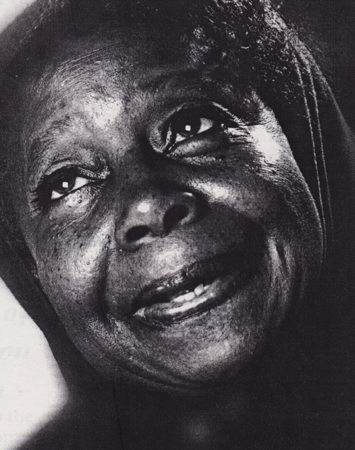 Do you want to know more about Butterfly McQueen? 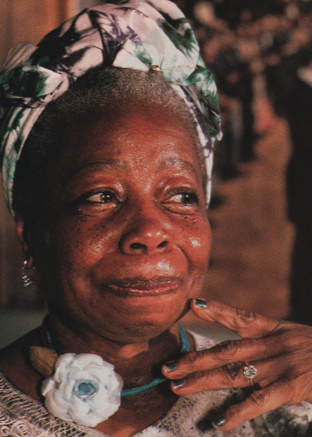 Read Stephen Bourne’s biography, Butterfly McQueen Remembered. 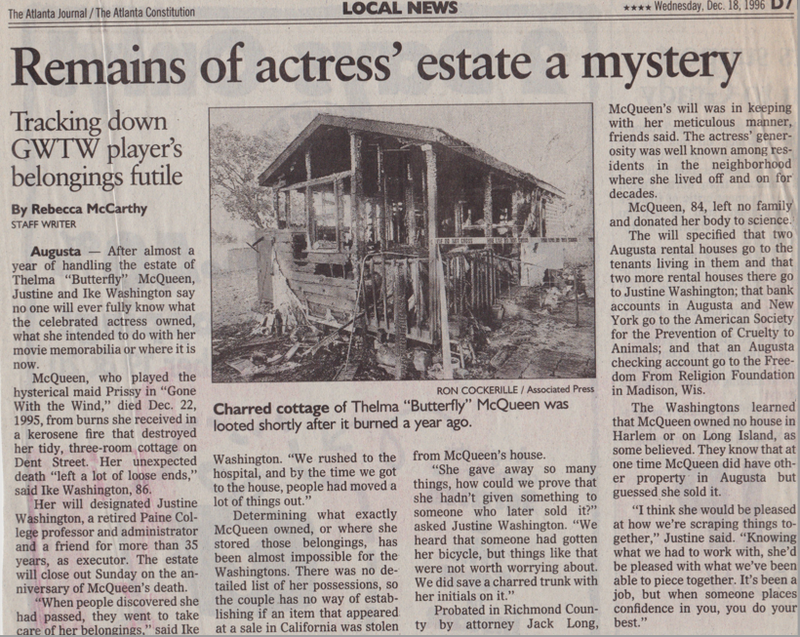 Butterfly died several days before Christmas in 1995. 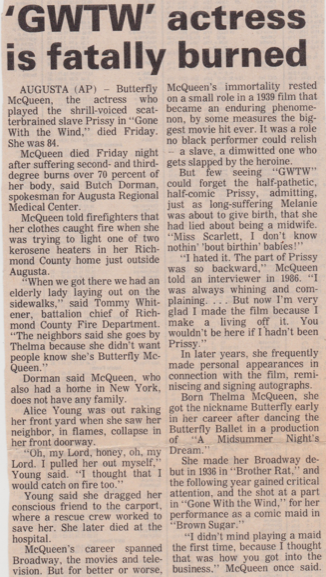 She suffered second- and third- degree burns over 70 percent of her body in a house fire in Augusta, Georgia.